Consumer Durables’ Major salutes armed forces: LG India Press Release! This year marks the 20th anniversary of the consumer durable major, LG Electronics India. The celebrations were kick-started with the #KarSalaam initiative, dedicated to Indian soldiers, which was launched prior to Republic Day. The campaign invited the whole nation to come forward and send their wishes to the Indian Armed Forces. This initiative was undertaken by LG to salute the soldiers’ spirit of contributing towards serving the nation. It is a commitment to LG’s corporate philosophy of `Life’s Good’ and a gesture of their support and solidarity to the soldiers for assuring that we lead a fearless and good life in this country . This campaign was rolled out through radio, digital, outdoor and mall activities in order to collect the messages and wishes of the people. The company also engaged people through social media platforms and encouraged them to share their wishes on http://www.karsalaam.in, where more than 2 lac wishes were collected online and offline. 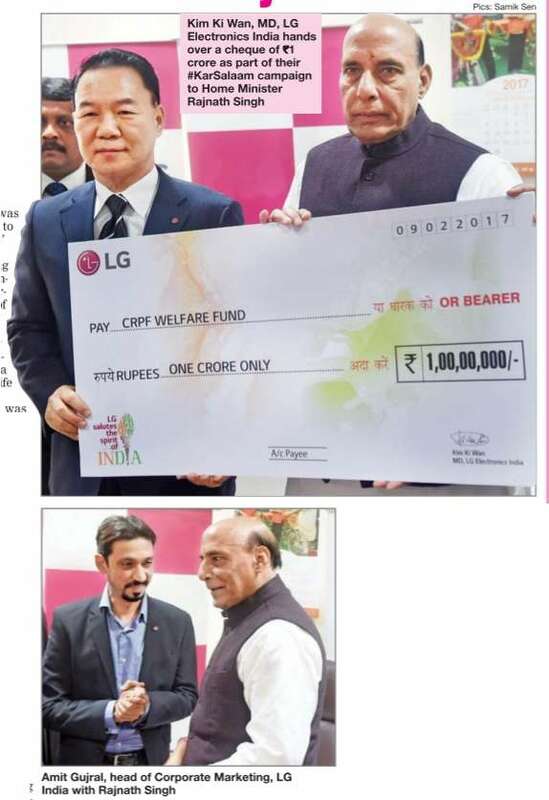 Taking the campaign forward, Kim Ki Wan, MD of LG India, handed over a cheque of one crore to the Home Minister Rajnath Singh for the CRPF welfare fund. LG Electronics India Pvt Ltd was established in India in January, 1997. It is one of the most formidable brands in consumer electronics, home appliances, IT hardware and mobile communications space. After being in India for two decades, LG has earned a premium brand positioning and is the acknowledged trendsetter for the industry.